Coupon Mama: Have to have BARBIE??? OK if you have to have BARBIE...good deal no BARBIE needed at our house. Kellie from Crazy Clippers just found this awesome deal on Barbie and the Three Musketeers and Barbie A Christmas Carol at Target! 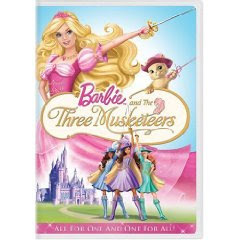 Be sure to look for the Barbie Musketeers DVDs that have the Christmas Carol peelie on them, and you’ll need a Toys R Us ad for price matching purposes. Both just $9.98 after price match & coupons!